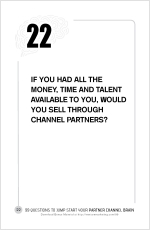 If you had all the money, time and talent available to you, would you still sell through Channel Partners? Home → Uncategorized → If you had the opportunity, would you still sell through Channel Partners? Polar opposites to say the least. But when I evaluate the background of the people in these two groups it probably comes as no surprise that Group 1 (channel non-believers) are folks with little in-the-field experience or those haling from finance/accounting/bean-counter jobs. Surprisingly, Group 2 (channel believers) includes former Group 1 people who got religion (i.e., field experience) somewhere along the line. Not that there isn’t an argument to be made for Channel realignment and regular evaluation, Channels play a vital role in the customer food chain. You simply cannot afford your own sales force. This is especially true for startups. Even SaaS application startups opt for channels. Infrequent purchases where it doesn’t make economic sense to regularly service customers who only buy from you once every year or so. Bundling opportunities. Your products are purchased with others. Just-in-time inventory staging. Frequently, Channel Partners ship only when their customers need the inventory, sparing the customer from the requirement for warehouse space. Competitive g2. Channel Partners provide a needed backchannel to you for industry gossip and goings-on. Breadth. Channel Partners provide market coverage that would take years to duplicate, especially in international markets. Just to close out this question I thought it might be helpful to provide you with a list of companies and markets with my comments on their go-to-market approach. Hope you find some surprises in the list. At first blush, I was going to say there is no exception—that professionals like doctors and lawyers always sell to their clients directly—but with the number of referral services and HMOs, I don’t know if I can make that universal case anymore. Other than farmer’s markets (many of which are really not run by the farmer), you probably bought your last bag of Doritos and eggs from a grocery store. Realtors sell the bulk of real estate. Only a fraction of homes are sold by the owner. Even though auto dealer sales reps rank the lowest among sales reps at-large, car makers choose to sell their autos through dealerships. Yes, Starbucks owns all their stores… unless you don’t count the Starbucks in urban areas where they’ve partnered with local, social advocates; the Starbucks in Target stores, the Starbucks at airports and sports facilities; and the Starbucks beans sold through, guess where, your local grocery store (which were distributed by Kraft until recently and now are distributed by Acosta). Between 20-40% of the world market is supplied through electronics distributors. The majority of consulting is sold direct. It’s estimated that at least 50% of all online courses, like those from AdWords guru Perry Marshall, are sold through Affiliates. A whopping 95% of Microsoft’s revenue comes through Channel Partners. No joke! OfficeMax, Staples, Office Depot…. Need I say more? Almost without exception, if you’re looking for insurance for your business, your building, your Directors & Officers and employees, an independent broker is your contact. Yes, FedEx, UPS and the Post Office sell direct, but all those shipping centers—even the UPS Stores—are franchise operations. Even the top dog, Steelcase, sells exclusively through dealers. No doubt, the base/core application is something you subscribe to directly from Salesforce.com, but very few companies would ever buy SFDC for it not for all the awesome add-on applications available through the AppExchange. It’s said that Salesforce.com has created the perfect ecosystem and mix between direct and indirect channels. Interesting use of engaging pro and con arguments, especially the breakdown of products and services in each area. Thought provoking and suggested some ideas for my clients.